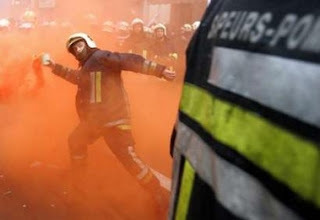 Brussels, Belgium - Firefighters protesting for better pay and working conditions fought riot police in pitched street battles. Helmeted demonstrators blocked streets with fire trucks, fired foam hoses and threw flares and other projectiles at police who responded with their own water cannons. The firefighters are demanding earlier retirement, better injury compensation, and for their occupation to be classified as a high risk profession. Three officers suffered facial injuries, and three firefighters had to be hospitalized, one of them from broken ribs after he fell off a water cannon.